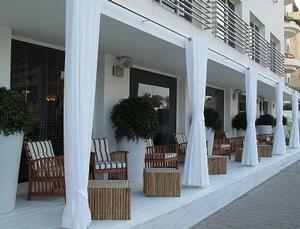 Steps from the amazing beach of Tel Aviv, Shalom is the ultimate hotel for stylish relaxation overlooking the blue sea. This completely new hotel was designed as a private beach house for those who are looking to enjoy the unique atmosphere of Tel Aviv’s beach life. Guests can enjoy pampering amenities such as TVs with personal computers in each room as well as free internet access throughout the hotel and a choice of free movies; amazing roof top lounge; a quality breakfast buffet and afternoon free drinks and appetizers; as well as an original collection of art by the famous Israeli artist Michael Argov. An assortment of teas and infusions are being offered at the hotel lobby throughout the day with no charge. This completely new hotel was designed as a private beach house for those who are looking to enjoy the unique atmosphere of Tel Aviv’s beach life. Guests can enjoy pampering amenities such as TVs with personal computers in each room as well as free internet access throughout the hotel and a choice of free movies; amazing roof top lounge; a quality breakfast buffet and afternoon free drinks and appetizers; as well as an original collection of art by the famous Israeli artist Michael Argov. An assortment of teas and infusions are being offered at the hotel lobby throughout the day with no charge. The hotel’s signature SPA rooms feature large bathrooms with a glass wall overlooking the room and an in-room whirlpool bathtub situated on a wooden deck by the window facing the sea. Superior rooms offer stylish bathrooms (some overlooking the sea) and sitting corners by the floor-to-ceiling windows which are the perfect place to enjoy the city’s or beach views. 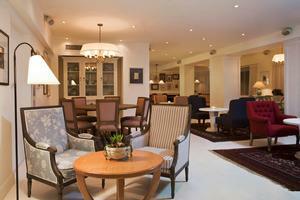 Standard rooms feature stylish design that compliments the relaxed and chic ambiance of this special hotel. All rooms are air conditioned and feature multi-channel cable TV, coffee & tea facilities, refrigerator, safe (suitable for personal computer), direct dial telephone with voice mail, as well as hairdryer. Guests enjoy free wireless internet access throughout the hotel, bicycle with no charge, and access to a near-by famous Gordon swimming pool (for an additional charge). 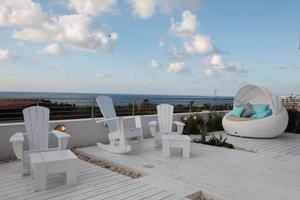 Steps from the amazing beach of Tel Aviv, Shalom is the ultimate hotel for stylish relaxation overlooking the blue sea. This completely new hotel was designed as a private beach house for those who are looking to enjoy the unique atmosphere of Tel Aviv’s beach life.